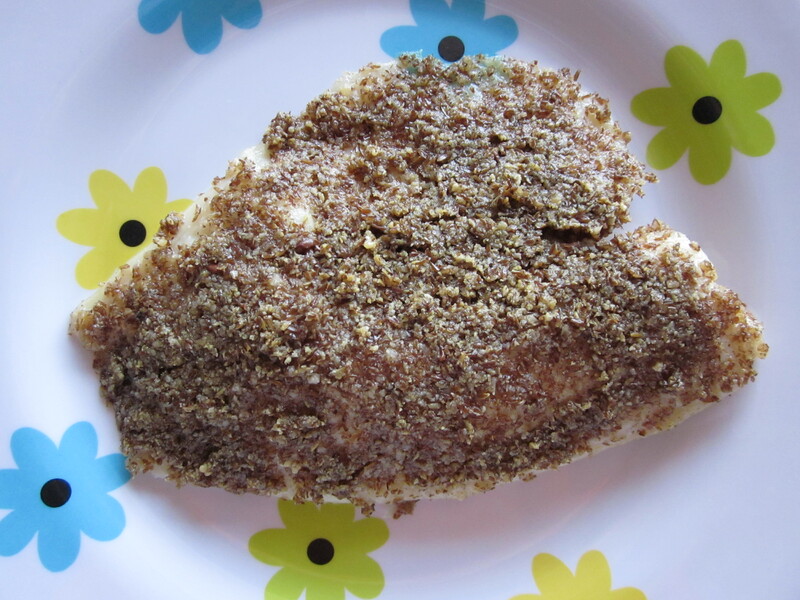 When I am in a time crunch for food and searching for something to make, tilapia is often the answer. Even if it’s still frozen, it can be quickly defrosted in a pitcher of water while I’m prepping the rest of dinner. It cooks pretty quickly too, which is always a bonus in my world. I keep a bag of fillets in the freezer so there is always a quick and healthy meal on the horizon. The inspiration for this dish came from a friend of mine who is a self professed “HEB pre-prepared food cook.” so you know it’s easy. She also makes it with salmon which is quite tasty. It’s nice to have a versatile recipe, yes? Well, let’s use the word “recipe” loosely and go with “formula,” perhaps. Remember my encouragement to experiment in making dishes your own. 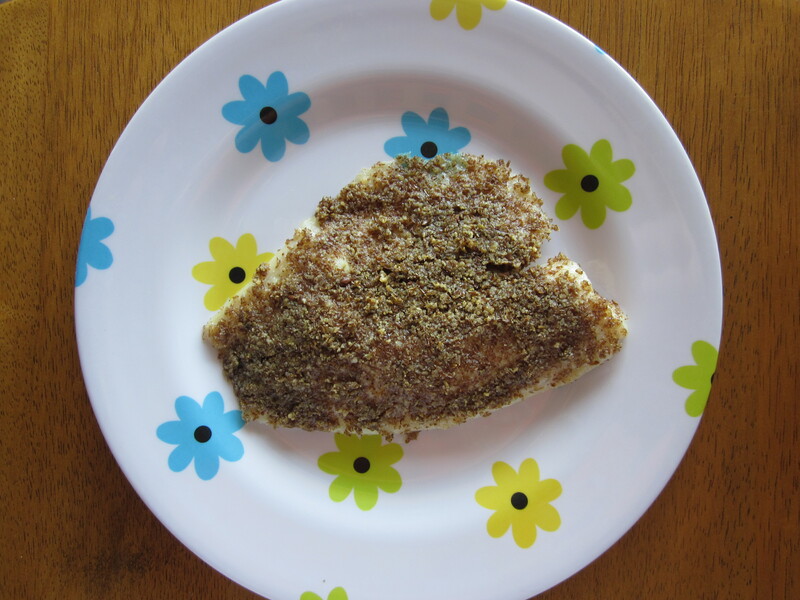 Here’s how I make Fast Flax Tilapia. 2. 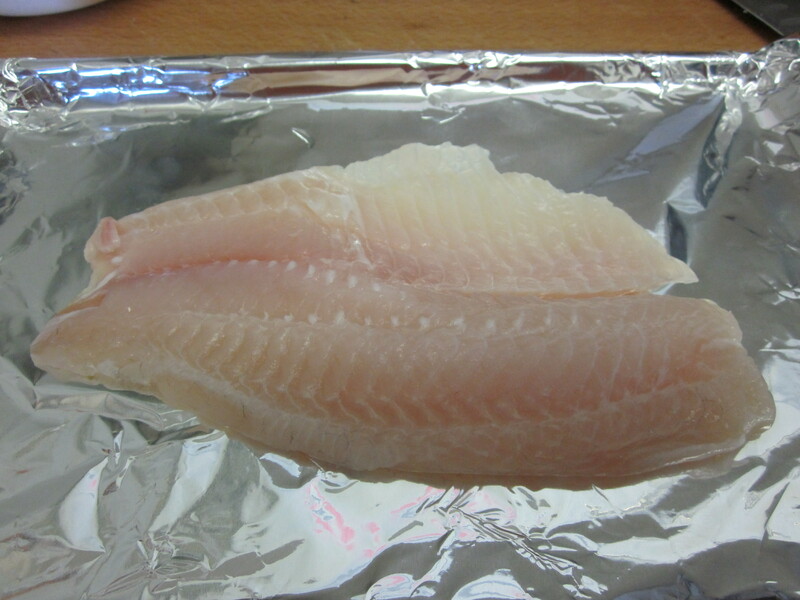 Rinse and pat dry your tilapia. 3. 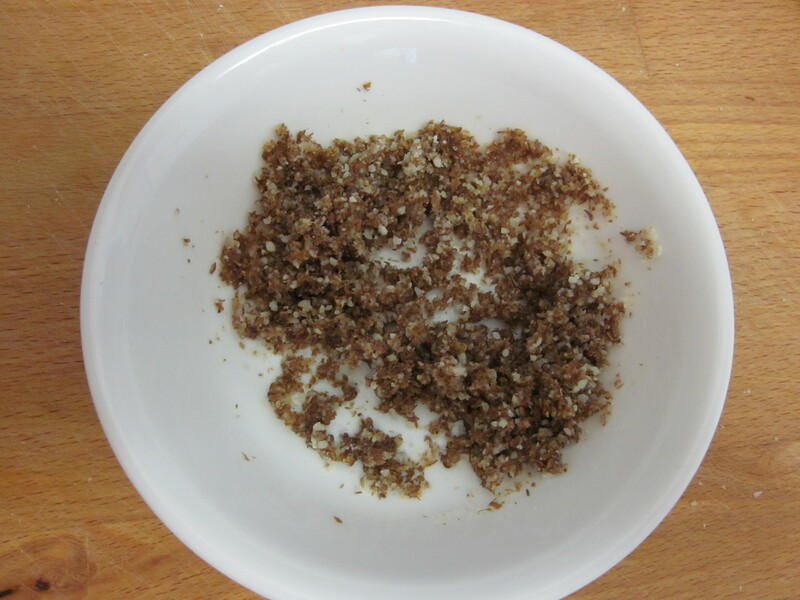 In a small bowl, mix the flax seed, cheese, and oil until it resembles a paste. 4. 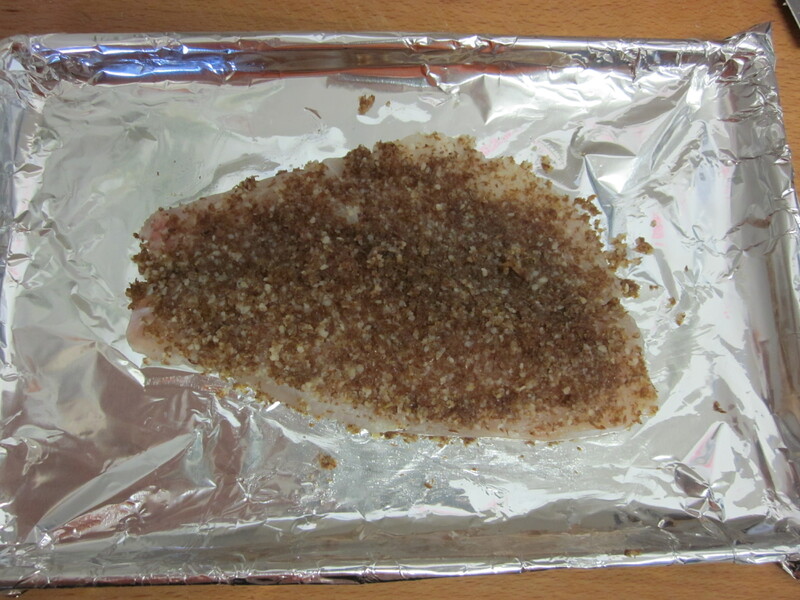 After laying your fish on your cooking surface (I generally prefer to line mine with foil. 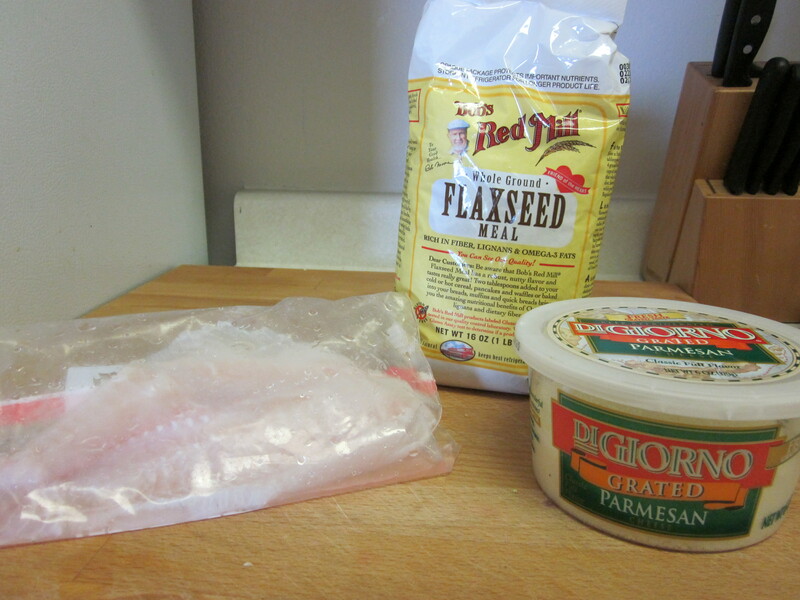 ), spread your flax paste on top of the fish, using all the paste. 5. When the oven is ready, pop in for 8 – 10 minutes. Check it after 8 minutes to see if it looks like a crust is forming. It will crisp up some more after you pull it from the oven, but it should be on it’s way to crispy when you pull it out. 6. Let it rest for a minute or two and then dig in! You could leave out or reduce the oil if you like, but I find it helps to get the topping crusty. It’s a bit more dry and crumbly without – but still tasty. Alternatively, you could leave the cheese out or substitute a different kind of ground seed, if that is your preference. I haven’t tried it on shrimp or scallops, but I am certain it would be delicious. This is a great template to build on. A note about defrosting: Please, please, please for the love of all that is culinary – do not leave your meats on the counter to defrost. That’s just an invitation for all kinds of badness and none of us need that in our lives, now do we? Instead, place your frozen meat (or other food) in a bowl or on a plate and set it in the fridge to thaw. I cannot recommend the receptacle to hold the item highly enough. This can save you from all sorts of unfortunate leakage all over your fridge. The thickness of the product you are defrosting usually dictates the amount of time needed for defrosting. I have found, however, that most (but certainly not all) meats will be defrosted by the time I get home from work if I’ve remembered to take it out of the freezer the previous night before I go to bed. Items like shrimp, scallops, tilapia, rice, etc., really only need the time while I’m at work to thaw out. Sometimes I forget to pull my chicken or beef from the freezer the night before. If this is your story too, do not despair. Keep the item in a zip-top bag, press all the air out, and put it in a tall glass, bowl, or juice pitcher with cold water. Put it in the fridge and head to work secure in the knowledge that it will be thawed by the time you get home. I’ve never come home to a meat in this situation that was still so frozen I could not make dinner. It works every time. Shrimp and tilapia can be defrosted in this manner when you get home from work if you have 15 minutes to let them rest in the cold water. I do not understand the chemistry by which cold water helps to defrost a frozen food, but I do know that it works. So my friends – please use this knowledge to your advantage in keeping dinner close at hand and food-borne illnesses far far away. Happy (& safe!) eating! Mmm, I had forgotten that I wanted to try making stuff with flax! It’s supposed to be a good egg replacer for baking, too. I used to know more about that water-thawing chemistry. Something about specific heat capacity. Ha, that’s probably more confusing than helpful, but thanks for the good ideas! You know, I use flax seed regularly in my baking, but I haven’t branched out much. Both my boys love tilapia. I, too, keep a bog a frozen fillets. I think I will try this next time I make it. Thanks. whenever you are ready to do a guest post, let me know! Pingback: Huevos Mexicanos « Let There Be Food!